The Science of Grounding | Paranormal Forum: " Where paranormal, science, and spirit meet"
Discussion in 'Spirituality / MetaPhysics / OBE / NDE' started by Debi, Jan 22, 2019. Thanks for sharing this Debi. I have done this naturally growing up. There is a wonderful peace that comes from standing barefoot. How great is it that we’re learning the science behind it. Now how to do this in winter is my next question ? WhitneyKristina and Debi like this. I think this is why so many in the Northern states get the winter time blues and depression so badly. Without that ability to ground on the earth, it can be difficult for people. JohnHermes and Lynne like this. I used to walk barefoot outdoors all the time, I truly enjoyed it. It made me feel like I was closer to nature and I always felt lighter after. But in recent years I have had to do it less and do it with more caution. A few years ago I was walking around at a park by my house, no shoes just enjoying the dirt and grass on my skin when I stepped on what I thought was a thorn. I checked my foot and nothing was there. A few days later my foot swelled up twice it's normal size. I went to the hospital and it turned out I had unknowing stepped on a piece of glass and it became lodged in my foot and got infected. I was lucky to have gone to the hospital when I did, and ended up being hospitalized for a week. I agree that grounding has a lot of benefits and more people should be doing it. But I just want to say be careful and cautious of where you step when barefoot. Good warning, Whitney. I normally walk in my own yard so I know exactly what's there. And I do want to add that for those of you unable to walk well, sitting on the ground will also help you ground. Even hands on the ground. Just being in contact with the Earth itself works. Another reason I have never worn gloves when gardening and planting. The contact between earth/plant/human is a power all of itself. Lynne, WhitneyKristina and Mokey like this. Grab on to a solid tree for balance if that is an issue too. Also trees are amazing for everything. You can also release any extra energy by firmly touching a tree. Or rock, etc..Treehugger is real! That energy is then going right back into our Earth with a positive charge. JohnHermes, Lynne, WhitneyKristina and 1 other person like this. This is an excellent way to ground in the winter ! Great advice Mokey. Rubber sole shows also get in the way of grounding. 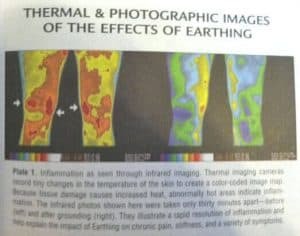 Some type of electromagnetic energetic exchanges that kill free radicals. Paintman and Lynne like this.